I married my opposite...but you know what they say: opposites attract. One of the many ways in which Andy and I are (VERY) opposite is our sleep schedule. He is an early riser, while I am definitely a night owl. It is just what our bodies do. We have tried, and will continue to try making it work to go to sleep and wake up close to the same time. Despite our efforts though, our bodies want to do what they want to do. According to the Science Daily, morning people tend to have an excitable brain at 9am which slowly decreases from that point on. Where as evening people's brains were most excitable at 9pm. I think that seems to ring true with both Andy and myself. As written by this article, evening people tend to have a higher IQ, but are less reliable and more emotionally unstable (ha!). 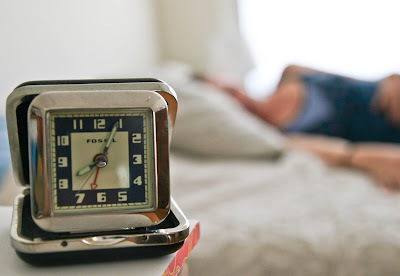 While morning people tend to be more conscientious, persistent, and apt to cooperate. There are some very interesting findings out there on night people versus morning people. To get straight to our source though, Andy and I have each written about what makes us an 'Early Riser' or 'Night Owl'. Growing up, I was both a morning person and a night person. As I got older I slowly became less of a morning person and more of a night person. This showed through in my passion for sleeping in and staying up late. I can get up early if I need to, but I don't function well when I do. I tend to be grumpy early in the morning, hate anything loud, don't like conversations, and I need to eat something right away in order to feel like I can function. I have discovered that the best time I DO function, is about 4pm or 5pm. It is around this time that I get a burst of energy and ideas start coming to me. I am inspired to work and motivated to get things done. From 4pm on I tend to be more alert and ready to take what comes at me. I could easily stay up until 2 or 3am every night. I think my brain is most creative between 11pm and 2am. During that time I have been known to cook, bake, or start a project. When I go to bed the same time Andy goes to bed (early), around 10pm, I often lay there for hours just waiting to fall asleep. If I do fall asleep right away, I tend to wake up in the middle of the night often with ideas. Sometimes these ideas are recorded in a notebook, but most often not (unfortunately). All of this sums up my 'Night Owl' habits and ways. I have always been an early riser. I partially contribute this to environment and family influence. My dad was always up before dawn, even when he didn't need to be (4:00AM playing crossword puzzles??). Being in construction, the day starts at 5:00AM and earlier. With this lifestyle, you learn to start the day hard. Get up, eat food, drink water and coffee, move around, exercise, talk to people loudly. (This bothers Ellie.) All of these things help me to get the day going before the sun rises. By afternoon, I am shot, so by the evening, I am ready for shut-eye at 9:00PM. I get in a poor mood quick if I am ready to go to bed and I am not in a place to do so or am told I need to complete something before bed. (Like writing this tonight...) This has happened before in many-a-places where I fall asleep while we are out. I have learned to give Ellie the 15-minute window before my battery drains. I am an early riser. There you have it. This is just our story though. What makes you a night owl or an early riser? When do you get your best work done...do you know why? Labels: early riser, Ellie vs. Andy, functionality, night owl, sleep, sleep schedule, sleeping in, staying up late, why am I a morning person?, why do I say up late? My husband and I are definitely opposites too, though I'm the early riser and he's the night owl. We've tried to align our sleeping schedules, but you're right that the body just does what it wants! Yeah, it's hard to find a good solution to that. I'm def. an early riser. In college while everyone pulled late nighters, I would go to be and wake up at 4:00 am to study. I'm a nurse and have turned down night positions (even though caring for patients is often much easier on nights) because I'd be a complete zombie. Your pics in the prev. post remind me of the pier Santa Cruz. Have you visited yet? Its a fun day trip. There are usu. seals hanging out on floats and a cool old wooden roller coaster. For dinner, we usu go to Palomar (Mexican) - they have good margaritas! The pics in the previous post are actually a San Francisco pier. We did however, visit the Santa Cruz pier this last weekend. What a fun place! We didn't make it to the boardwalk with the roller coasters due to rain, but that just means we'll have to go again soon. I'll have to remember the Mexican restaurant for next time, I love a good margarita! I agree with toni! In college, I would regularly go to bed at 9 or 10 in order to get up at 4 or 5 and finish projects or study... it was my equivalent of an "all-nighter". Now, I find that I naturally "nap" before bedtime around 8 or 9 pm and then go to "real bed" at 11.... I generally wake naturally around 7. I don't think this makes me an especially early-riser as much as it makes me a serious sleep-needer. I have many memories of seeing Andy fall asleep during group hang-outs and then giving myself permission to do the same!